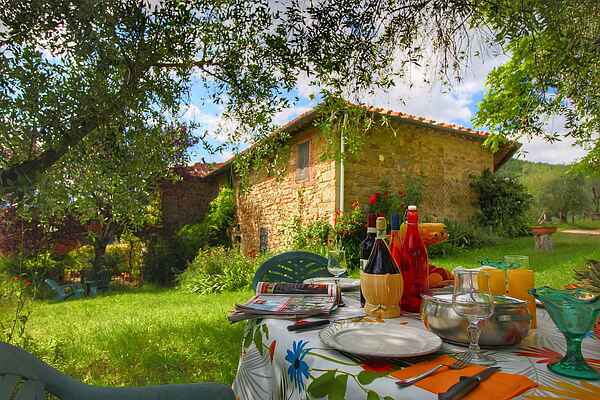 You will stay in a so-called casa colonica on the estate Petrognano in Tuscany. People who worked on the estate used to live in this house. It's a great house for people who like an authentic atmosphere. On the ground floor you will find the living room/kitchen, restored in Tuscan style with beamed ceiling and the characteristic open fireplace that is clearly dominant. The counter is made of authentic marble, and the furniture fits perfectly with this old atmosphere. The bedroom on the ground floor, with two single beds, has French doors leading to your own lawn, and the bedroom on the top floor (with a double bed) has a beautiful view of the valley. The estate features a swimming pool, fish pond and tennis court. Pomino is a small authentic village (2 kilometers away), while Rufina (7 kilometers away) has a place to go for your daily shopping. The estate of Petrognano lies - even for Tuscany - in an exceptionally beautiful setting between the Apennines and the Tuscan hills. Fattoria di Petrognano is 30 km from Florence, surrounded by its own forest land, in the peaceful Pomino region, famous for its wine and oil.